"PoE" redirects here. For other uses, see Poe (disambiguation). Not to be confused with Ethernet over power. Given a single Power over Ethernet connection (single gray cable looping below), a PoE splitter provides both data (gray cable looping above) and power (black cable also looping above) connections for a wireless access point. The splitter is the silver and black box in the middle, between the wiring box on the left and the access point (with its two antennas) on the right. The PoE connection eliminates the need for a nearby power outlet. Power over Ethernet or PoE describes any of several standardized or ad-hoc systems which pass electric power along with data on twisted pair Ethernet cabling. This allows a single cable to provide both data connection and electric power to devices such as wireless access points and IP cameras. 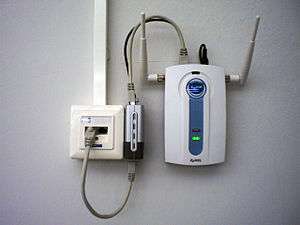 There are several common techniques for transmitting power over Ethernet cabling. Two of them have been standardized by IEEE 802.3 since 2003. Only two of the total four twisted pairs in an Ethernet cable are used for data in 10BASE-T or 100BASE-TX Ethernet; thus, power can be transmitted on the unused two pairs. In IEEE standards, this is referred to as Alternative B. It is a common PoE technique because it separates data and power conductors, making troubleshooting easier. Power may also be transmitted on the data conductors by applying a common-mode voltage to each pair. Because twisted-pair Ethernet uses differential signalling, this does not interfere with data transmission. The common mode voltage is easily extracted using the center tap of the standard Ethernet pulse transformer. This is similar to the phantom power technique commonly used for powering audio microphones. In the IEEE standards, this is referred to as Alternative A. In addition to standardizing existing practice for spare-pair (Alternative B) and common-mode data pair power (Alternative A) transmission, the IEEE PoE standards provide for signalling between the power sourcing equipment (PSE) and powered device (PD). This signaling allows the presence of a conformant device to be detected by the power source, and allows the device and source to negotiate the amount of power required or available. Up to 25.5 W is available for a device. The original IEEE 802.3af-2003 PoE standard provides up to 15.4 W of DC power (minimum 44 V DC and 350 mA) on each port. Only 12.95 W is assured to be available at the powered device as some power dissipates in the cable. Standards body IEEE is currently looking at ways of increasing the amount of power transmitted. The upcoming IEEE 802.3bt aka 4PPoE (4 Pair Power over Ethernet) standard will introduce two new levels of power: 55 W (Level 3) and 90-100 W (Level 4). Each twisted pair can handle a current of up to one ampere. Additionally, support for 2.5GBASE-T, 5GBASE-T and 10GBASE-T is planned. This development opens the door to new applications and expands the use of applications such as operating high-performance wireless access points and surveillance cameras. PoE provides both data and power connections in one cable, so equipment doesn't require a separate cable for each need. For equipment that does not already have a power or data connection, PoE can be attractive when the power demand is modest. For example, PoE is useful for IP telephones, wireless access points, cameras with pan tilt and zoom (PTZ), and remote Ethernet switches. PoE can support long cable runs e.g. 100 m (330 ft) and deliver 12 W of galvanically isolated power. PoE-plus provides even more power. If a device already has power available but no data link, then PoE may not be attractive. 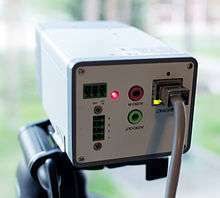 A wireless data connection such as IEEE 802.11 or power line communication may be more economical than running a data cable for the device. When data rate and power requirements are both low, other approaches may be viable. Some security alarm systems use battery-powered sensors that communicate wirelessly. Remote weather sensors for personal weather stations use very low data rates, so batteries (sometimes supplemented with solar power) and custom wireless data links are used. An IP camera powered by Power over Ethernet. Outdoor roof mounted radios with integrated antennas, 802.11 or 802.16 based wireless CPEs (customer premises equipment) used by wireless ISPs. Power sourcing equipment (PSE) is a device such as a network Switch that provides (or sources) power on the Ethernet cable. The maximum allowed continuous output power per cable in IEEE 802.3af is 15.40 W. A later specification, IEEE 802.3at, offers 25.50 W.
Most advocates expect PoE to become a global longterm DC power cabling standard and replace "wall wart" converters, which cannot be easily centrally managed. Critics of this approach argue that PoE is inherently less efficient than AC power due to the lower voltage, and this is made worse by the thin conductors of Ethernet. A typical 48-port Ethernet switch has a 50 W to 80 W power supply allocated for the traditional Ethernet switch and transceiver IC. Over and above this it requires typically a 740 W (for 802.3af) to 1480 W (for 802.3at) power supply allocated solely for PoE ports, permitting a maximum draw on each. This can be quite inefficient to supply through long cables. However, where this central supply replaces several dedicated AC circuits, transformers and inverters, and prevents expensive human interventions (AC installations) the power loss of long thin DC cable can be justifiable. Power can always be introduced on the device end of the Ethernet cable (radically improving efficiency) where AC power is available. "With the evolution of PoE from a fairly low power source (up to 12.95 W per port) to one with devices of up to 25.5 W, the direct current (DC) power losses over Ethernet cables increased exponentially. Approximately 4.5 W/port of power is wasted on a CAT5, CAT5e, CAT6 or CAT6A cable...after 100 m... EEE typically saves no more than 1 W per link, so addressing the 4.5 W per link loss from PoE transmission inefficiency would provide much more incremental savings. New energy-efficient PoE (EEPoE) technology can increase efficiency to 94% while transmitting over the same 25 ohm cable, powering IEEE 802.3at-compliant devices in synchronous 4-pairs. When utilizing synchronous 4-pairs, powered devices are fed using all the available wires. For example, on a 24-port IEEE 802.3at-2009 Type 2 system (delivering 25.5 W per port), more than 50 W are saved." ↑ Most switched power supplies within the powered device will lose another 10 to 25% of the available power. ↑ More stringent cable specification allows assumption of more current carrying capacity and lower resistance (20.0 Ω for Category 3 versus 12.5 Ω for Category 5). IEEE 802.3at capable devices are also referred to as "type 2". An 802.3at PSE may also use layer2 communication to signal 802.3at capability. Class 4 can only be used by IEEE 802.3at (type 2) devices, requiring valid Class 2 and Mark 2 currents for the power up stages. An 802.3af device presenting a class 4 current is considered non-compliant and, instead, will be treated as a Class 0 device. PSE (provider) tests PD (consumer) physically using 802.3af phase class 3. PD sends to PSE: I'm a PD, max power = X, max power requested = X.
PSE sends to PD: I'm a PSE, max power allowed = X.
PD may now use the amount of power as specified by the PSE. Some Cisco manufactured WLAN access points and IP phones supported a proprietary form of PoE many years before there was an IEEE standard for delivering PoE. 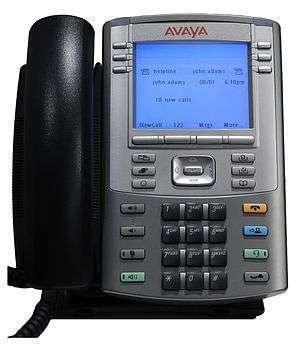 Cisco's original PoE implementation is not software upgradeable to the IEEE 802.3af standard. Cisco's original PoE equipment was capable of delivering up to 10 W per port. The amount of power to be delivered is negotiated between the endpoint and the Cisco switch based on a power value that was added to the Cisco proprietary Cisco Discovery Protocol (CDP). CDP is also responsible for dynamically communicating the Voice VLAN value from the Cisco switch to the Cisco IP Phone. Under Cisco's pre-standard scheme, the PSE (switch) will send a Fast Link Pulse (FLP) on the transmit pair. The PD (device) connects the transmit line to the receive line via a low pass filter. And thus the PSE gets the FLP in return. And a common mode current between pair 1 and 2 will be provided resulting in 48 V DC and 6.3 W default of allocated power. The PD has then to provide Ethernet link within 5 seconds to the auto-negotiation mode switch port. A later CDP message with a type-length-value tells the PSE its final power requirement. A discontinued link pulses shuts down power. In 2014, Cisco created another non-standard PoE implementation called Universal Power over Ethernet (UPOE). UPOE can use all 4 pairs, after negotiation, to supply up to 60 W.
A proprietary high-power development called LTPoE++ using a single CAT-5e Ethernet cable is capable of supplying varying levels at 38.7 W, 52.7 W, 70 W, and 90 W in addition to being backwards compatible with IEEE 802.at. PowerDsine, acquired by Microsemi in 2007, has been selling midspan power injectors since 1999 with its proprietary Power over LAN solution. Several companies such as Polycom, 3Com, Lucent and Nortel utilize PowerDsine's Power over LAN. The common 100 Mbit/s passive applications use the pinout of 802.3af mode B - with DC plus on pins 4 and 5 and DC minus on 7 and 8 (see chart below) and data on 1-2 and 3-6. Gigabit passive injectors use a transformer on the data pins to allow power and data to share the cable and is typically compatible with 802.3af Mode A. In the common "passive" PoE system, the injector does not communicate with the powered device to negotiate its voltage or wattage requirements, but merely supplies power at all times. Passive midspan injectors up to 12 ports simplify installations. Devices needing 5 Volts cannot typically use PoE at 5 V on Ethernet cable beyond short distances (about 15 feet (4.6 m)) as the voltage drop of the cable becomes too significant, so a 24 V or 48 V to 5 V DC-DC converter is required at the remote end. Passive DC-to-DC injectors also exist which convert a 9 V to 36 V DC input power source to a stabilized 24 V 1 A or 48 V 0.5 A PoE feed with '+' on pins 4 & 5 and '−' on pins 7 & 8. These DC-to-DC PoE injectors are used in various telecom applications. Category 5 cable uses 24 AWG conductors, which can safely carry 360 mA at 50 V according to the latest TIA ruling. The cable has eight conductors (only half of which are used for power) and therefore the absolute maximum power transmitted using direct current is 50 V × 0.360 A × 2 = 36 W. Considering the voltage drop after 100 m (330 ft), a PD would be able to receive 31.6 W. The additional heat generated in the wires by PoE at this current level (4.4 W per 100 m cable) limits the total number of cables in a bundle to be 100 cables at 45 °C (113 °F), according to the TIA. This can be somewhat alleviated by the use of Category 6 cable which uses 23 AWG conductors. ↑ "Amendment to IEEE 802.3 Standard Enhances Power Management and Increases Available Power". IEEE. Retrieved 2010-06-24. ↑ Clause 33.3.1 stating, "PDs that simultaneously require power from both Mode A and Mode B are specifically not allowed by this standard." ↑ "IEEE P802.3bt DTE Power via MDI over 4-Pair Task Force". 2016-03-29. Retrieved 2016-08-03. ↑ "Power over Ethernet". Commercial web page. GarrettCom. Retrieved August 6, 2011. ↑ "The Bright New Outlook For LEDs: New Drivers, New Possibilities" (PDF). Commercial Application Note. Maxim Integrated. Retrieved 27 April 2015. ↑ "Ethernet Extender for POE and POE Plus equipment". Retrieved 2015-10-26. ↑ "GS108PE". Netgear.com. Retrieved 2013-06-01. ↑ "Power over Ethernet Interface Controllers".